Rubber Room Ramblings: LAST DAY FOR FREE MARKERS! Sign for My Paper Pumpkin by Midnight February 10th, 2014 and receive a set of 2012-2014 in-color markers FREE! 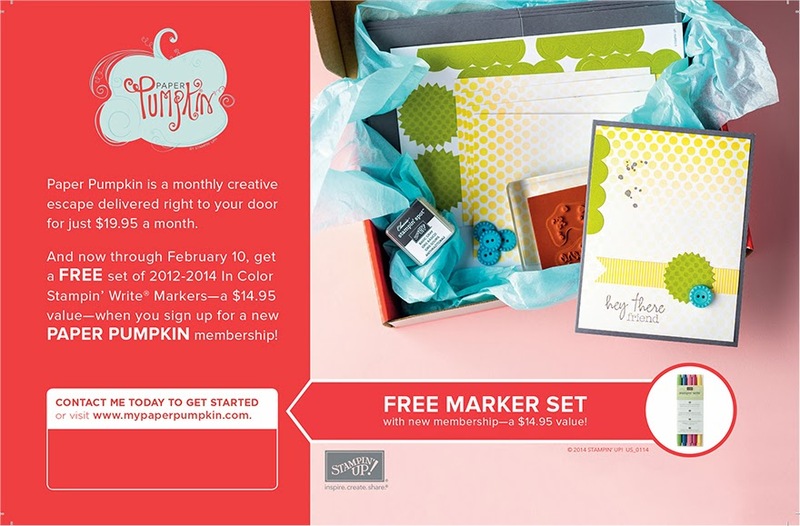 Paper Pumpkin is a monthly escape delivered directly to your door, AND it is only $19.95 per month, AND when you sign up to receive Paper Pumpkin on or before February 10th, you get a set of FREE markers. What is Paper Pumpkin? It is an all-inclusive stamping/paper crafting project. It has all the stamps, ink, paper an accessories to create projects like cards, journals, gifts and so much more! The materials are all cut, measured and ready to use. And project instructions are included! I bet you get your favorite magazines delivered to your door each month, fix yourself a nice relaxing beverage and sit and enjoy. Well, why not do the same with a craft? Your Paper Pumpkin arrives, you fix a nice latte, turn your favorite radio station on and take a few minutes to relax and feed your creative energy! Have a friend you love to see, but never make the time? Well, invite her to sign up too. When your Paper Pumpkin arrives each month, get together and catch up while you craft. 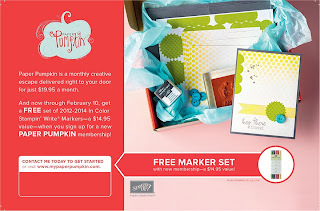 There are so many reasons to sign up for Paper Pumpkin, and no matter what your reason is, now is a great time to sign up and get some FREE markers too! ORDER HERE BEFORE MIDNIGHT TODAY!